I frequently roast vegetables, and when I read Greg’s post about roasted figs I knew I needed to give them a second chance. I agree that roasting figs at a high temperature produces the most amazing jammy and candy-like morsels. I’m happy to report that this preparation rocked my opinion about figs! 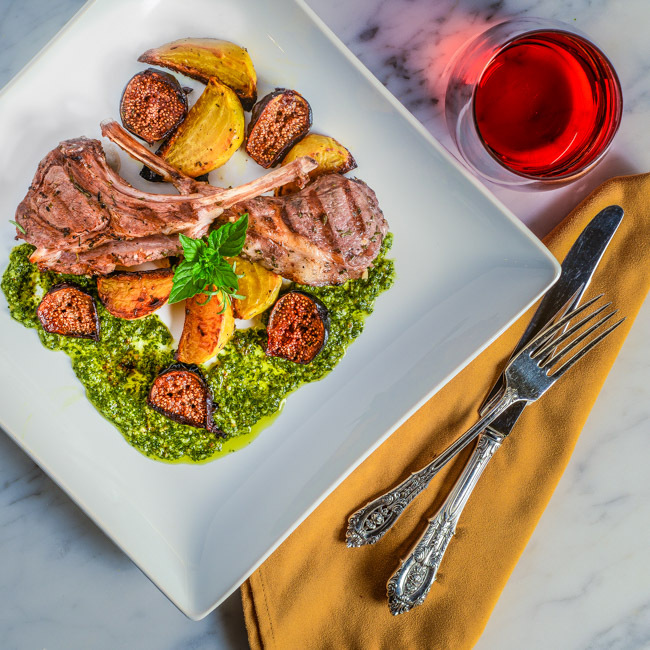 As I was thinking about this post, I decided that grilled lamb chops with mint pesto and roasted golden beets would be the perfect complement to the figs. I typically roast beets whole and unpeeled but for this recipe, I peeled and sliced them and roasted them alongside the figs. Much like the figs, the resulting beets were slightly caramelized. Mint jelly frequently accompanies lamb. For this recipe, I made a mint pesto and as an homage to mint jelly, I added some honey to the pesto. The sweetness of the figs, beets, and pesto played perfectly with the savory rosemary and garlic marinated lamb. 1. Transfer mint, parsley, garlic, almonds, lemon zest, lemon juice, honey, salt, and pepper to the bowl of a food processor. Process until finely chopped. With processor still running, slowly add olive oil and process until smooth. Transfer to a small bowl. Cover and refrigerate until needed. Remove from refrigerator 15 minutes before serving. 1. Combine garlic, rosemary, mint, lemon zest, lemon juice, salt, pepper in a bowl large enough to hold lamb chops. Whisk ingredients together. Slowly add olive oil, continuing to whisk. When combined, transfer lamb chops to bowl and toss to coat with marinade. Cover and refrigerate for 2 hours. 2. Preheat grill or grill pan to high heat. Grill lamb chops for 2 to 4 minutes on each side until internal temperature reaches 130 for medium rare or 140 for medium. Remove from heat, cover with aluminum foil, and let rest for 5 minutes. Preheat oven to 400 degrees. Combine rosemary, salt, pepper, and olive oil. Toss vegetables in oil mixture, being careful to not break up figs. Place beets and figs on a baking sheet and roast for 25 to 30 minutes, or until beets are tender and figs are caramelized. Spoon pesto onto plates. Divide beets and figs among plates. Depending on size, top plate with 2 or 3 lamb chops. Garnish with mint leaves and serve immediately. Wow, what a GORGEOUS dish! Those figs look incredible! I’m going through a serious lamp chop love phase so these are definitely on my next list of things to try! Amazing! Greg henry knows how to describe figs. I have a turkey fig tree in my backyard and that was the beginning of my love affiar with figs. Your lamb with roasted figs and mint jelly is divine. What an absolutely beautiful meal for the late summer. Now that’s a scrumptious meal!!! I love lamb chops with mint pesto, but have never had them with roasted figs. What a great combination of flavors. I’ve never been a fan of beets, but a friend of mine has been trying to get me to try the golden beets for a while now. They sure look good in this dish. Thanks for the inspiration Bill! I like the combo of mint and lamb a lot, but am not that fond of the usual jelly (I like it, just not with lamb). The mint pesto is perfect! Great dish — thanks.